The first time I went to Paris, I may have driven my friends a little mad with my requests to stop at what felt like every shop that sold macarons. There were macarons in every color of the rainbow and so many delicious flavors available, it was impossible not to want to try them all! One of my favorites was the strawberry macaron. I must have tried strawberry macarons from each shop we visited. It’s not the most exciting flavor, but I tend to gravitate to strawberry-flavored things in general. I’m naturally drawn to the sweetness of the taste and smell of strawberries and strawberry-flavored desserts! With strawberry season upon us, this would be a special treat to make and share with your family and friends! It’s true that macarons are finicky little cookies and that it takes some practice to get these down. I took a macaron-making class at La Cuisine Paris during my second trip to Paris and learned how to make an Italian meringue macaron. Macarons made using the Italian method felt chewier to me and didn’t taste as sweet as macarons made using French method. The Italian method includes making a hot sugar-water syrup and whipping it into egg whites to make a stable meringue. Even though the Italian method takes a little more time and energy, it produces what I feel is a better cookie. An important note when making macarons is to weigh your ingredients! A friend and I had a baking day and did a mini experiment measuring flour. We both scooped out one cup of flour, using the same measuring cup. As expected, her cup of flour was different from my cup of flour, because we packed (or did not pack) them the same way. For consistent results, always weigh your ingredients! It’s especially important for macarons, where precision is everything! The part that makes me most nervous about making macarons is the macaronage, the step when mixing the meringue with the rest of the batter. Some people say to mix the macaron batter until a lava consistency is reached. I tend to look for two things to happen: 1) if a “V” shape forms when I mix the batter and lift my spatula, it’s not ready yet, but it’s getting close; and 2) if I lift my spatula and the batter is a little thick, yet runny, and falls smoothly into the mixing bowl (not just plopping into the bowl) into ribbons that slowly disappear into the rest of the batter after a few seconds, then the batter is ready. If all goes well, you will be rewarded with shells that rise with little craggy feet under a beautifully smooth and flat top with nice and chewy center when bitten into. No matter how they turn out, they are delicious, and you can break them up and add them to ice cream as a macaron topping! Macaron shells usually don’t have a lot of flavor to them. The filling is what makes these gems shine. 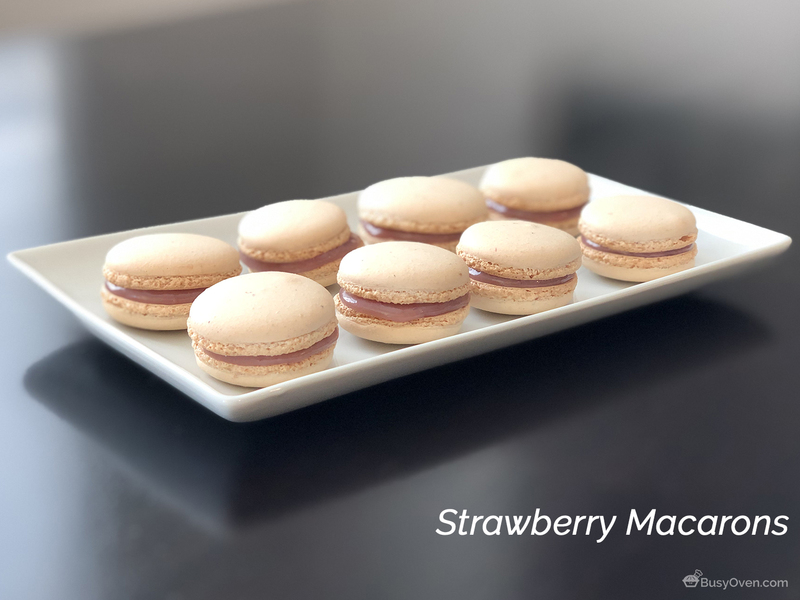 The pulverized freeze-dried strawberries in these macaron shells really come through and enhance the flavors of the strawberry white chocolate filling (strawberry Swiss meringue buttercream would also work well). It’s also nice seeing tiny strawberry specks in the shells! I chose not to use any food coloring to my macarons because I wanted to see how far natural coloring from the strawberries would go. A delicate pick color that matches the delicate flavors of the strawberry macarons was the result. Place the fresh or frozen strawberries and sugar into a small saucepan and bring to a boil, stirring constantly. Simmer and reduce for about 5 minutes or until the mixture thickens and remove from heat. Strain to remove large chunks of strawberries. Place the strained strawberries, whipping cream, and white chocolate in a small saucepan and melt everything together over low heat. After the white chocolate is completely melted, add the freeze dried strawberries and red food coloring (if using). Transfer to a small bowl, let cool completely and refrigerate before using. Line two baking sheets with parchment paper and prepare a pastry bag with a plain tip (about ½ inch, 1 cm). Preheat oven to 300F (150C). In a food processor, pulse the powdered sugar, almond flour, and freeze-dried strawberries until you have a fine powder, ensuring that all of the strawberries are pulverized. Sift through a sieve into a large bowl and set aside. Note: this large bowl will eventually hold all of the ingredients. In a small bowl place 55g egg whites and red food coloring (if using, and to your liking). Mix together until well combined. Combine the egg whites over the sieved almond/sugar/strawberry mixture. This will create a very thick paste. Place the other 55g egg whites and salt into a mixing bowl. Set aside until you prepare the sugar syrup. In a small saucepan combine the granulated sugar with water and place on medium heat. Using a candy thermometer measure syrup temperature. When it reaches 230 F (112C) start whipping the egg whites until the whites are foamy and frothy. When the syrup reaches 244F (118C) pour it over the whipped egg whites in a steady stream, while mixing continuously. Continue beating on high until the bowl has cooled slightly, and glossy stiff peaks have formed. Note: Your peaks will probably be a little floppy, which is perfect. Add one-third of the the whipped whites over the paste mixture and using a rubber or silicone spatula and fold in until combined and smooth. Don’t worry about being too gentle here, this first addition is just to loosen the paste. Add the next third of the whipped whites, folding them in gently. When no traces of whites remain, gently fold in the final third. Work the batter until it flows in very thick ribbons when the spatula is lifted. If you lift your spatula and the batter hangs and makes a “V” shape, keep on mixing. Transfer the mixture to the piping bag fitted with a 1/2 inch (1 cm) plain round tip. Pipe the batter on the parchment-lined baking sheets in 1.5-inch circles, evenly spaced one-inch apart. Rap the baking sheet a few times firmly on the counter top to flatten the macarons and to remove air bubbles. If any bubble burst on the surface, take a toothpick and fill in the gaps. Let the piped circles rest until a skin forms. You should be able to gently touch the tops of the circles without your finger getting batter on it. Bake one sheet at a time for 13-15 minutes. If you can lift the macarons from the parchment paper, they’re done. Let the shells cool for 3 minutes before removing them from the baking sheet. Repeat with next sheet. Place the strawberry white chocolate filling into a piping bag and spread on the inside of the macarons and sandwich them together. You can also spoon the filling onto the shells. Be careful not to overfill these macarons because this filling can be oozy. Refrigerate the assembled strawberry macarons for at at least one day before serving, to develop the flavors.